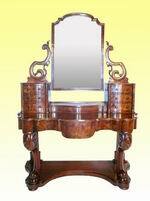 Fine quality pair of narrow Antique Victorian bow front mahogany bedside chests of drawers . 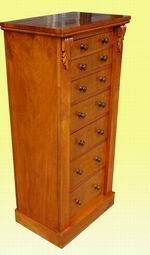 The chests are constructed of solid mahogany with mahogany lined dovetail jointed drawers that all slide nice and smooth . 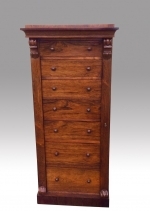 Superb Small Georgian Mahogany Chest of Drawers Of Neat Proportions. 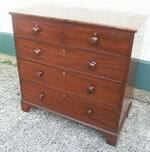 Superb Small George III Mahogany Chest of drawers of neat proportions with four graduated drawers with original key and working locks ,it stands on ogee bracket feet. 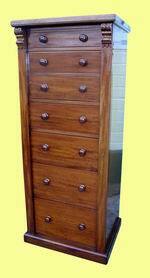 The chest is in excellent original condition and has a lovely patina. 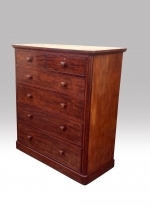 Superb quality antique mahogany chest of drawers. 48ins wide X 23ins deep X 42ins high. 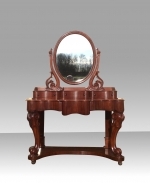 A magnificent antique Gillows kidney shaped burr walnut and satinwood inlaid writing desk .The burr walnut satinwood and ebony banded and tooled leather top fitted with a single concave drawer. 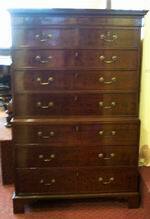 Top of drawer stamped Gillow & Co 9724. 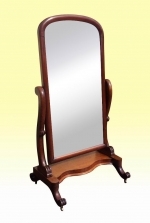 The kidney shaped under-tier with a pierced and swag brass cast gallery supported on four gilded fluted turned legs with turned feet terminating in brass cappings and castors. 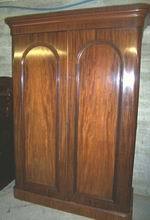 An excellent quality walnut and mahogany three door wardrobe from the late Victorian period. 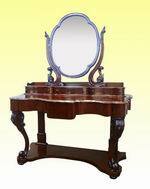 Of very goord construction. The three doors each opens to access very cleaned lined hanging space behind. 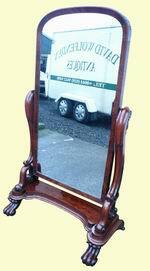 The two outer doors are fitted with original beveled plate mirrors, Further storage is afforded by two drawers. 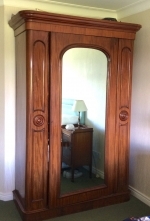 This practical and attractive wardrobe is offered for sale in excellent original condition, ready to go straight into the home. 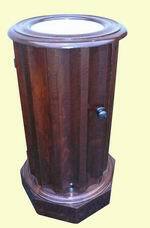 Previous Owner Had Removeable Quality Mahogany Tops Made To Cover The Wash Basin Holes In Order To Make More Practical as Tables. Very Easily Removed By The Turning Of Two Levers. 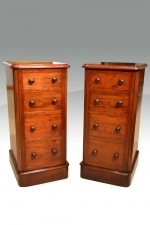 Superb pair of antique Mahogany bedside chests,cabinets. 21deep x 17 wide x 39high . 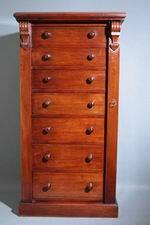 Mahogany lined drawers,all running freely. 42.25 ins wide X 21.25ins deep X 44ins high. 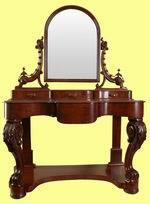 A Stunning Antique Victorian Mahogany Duchess Dressing Table. 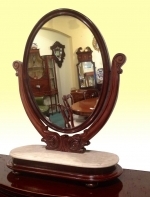 A good pair of antique mahogany Victorian Period antique bedside cabinets. 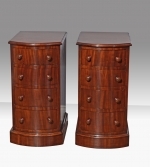 Condition: This pair of bedside cabinets are in excellent condition. 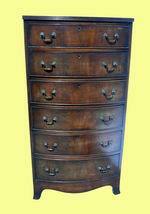 Superb Quality Early Victorian Mahogany Large Antique Chest of Drawers. 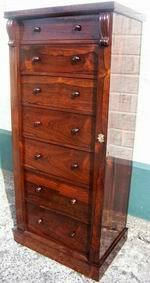 Drawers sliding in and out beautifully. 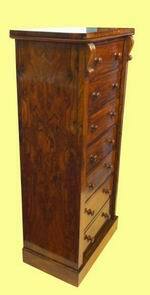 Quality 19th Century Figured Walnut Antique Secretaire Wellington Chest In Fabulous Condition. 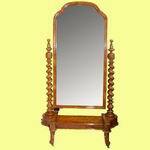 same to opposite side. All on plinth base. 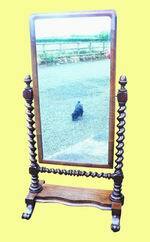 Plate glass in perfect condition. 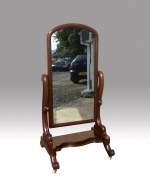 The Mahogany has super colour and patina with an arched top. 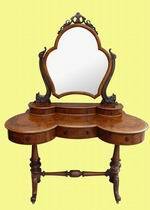 The base has wonderful serpentine shape and is finished with scroll worked legs and original brass casters. 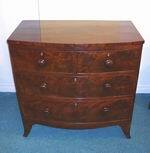 A fine quality early Victorian flame Mahogany bow front narrow antique chest of drawers . 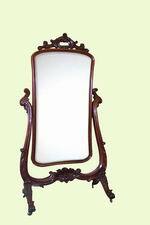 A fine quality Victorian Mahogany antique cheval mirror c1860. 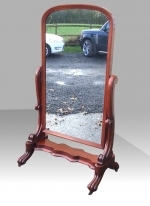 The Mahogany has super colour and patina. 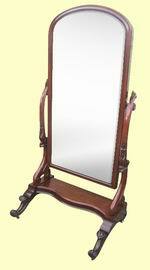 There is an arched top with a cross banded flat step moulding which is chamfered toward the mirror plate. 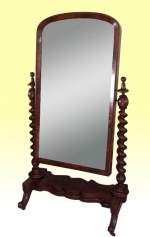 The supports are beautifully turned with barley twist columns and turned minuet finials. 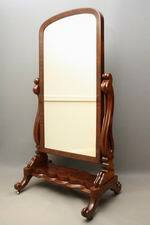 The back of the mirror is well panelled and also Mahogany. 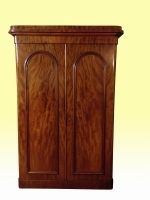 The top of the base has super flame Mahogany grain. 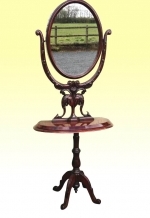 The base has wonderful shape and decorative mouldings and is finished with scroll worked legs and original brass casters. 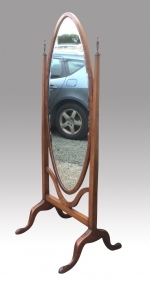 A stunning period full length mirror in super retail condition ready for your home. 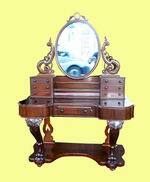 The dimensions are approx 65 inches high and 35 inches wide. Rich Colour is consistant throughout,not as pictures. 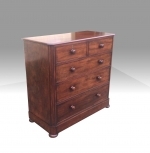 A Quality Stamped Victorian Mahogany Chest of Drawers. 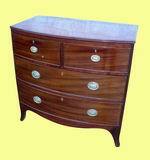 The moulded rectangular top with rounded corners above two short and three long graduated drawers to squat bun feet. 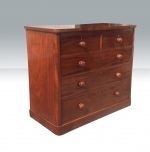 Each drawer stamped �J & L Trueman Manufacturers, Doncaster�. 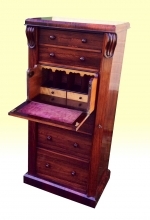 The quality of timber used, combined with the stunning colour of this chest add to the rarity of finding a stamped piece of Victorian furniture.